I’ve got to hand it to the White Mountains. In the battle of the mountains v. my knees, the score is White Mountains: one; my knees: zero. At least at the moment. I’m too stubborn to surrender yet. But I have to admit that these mountains have got me cowed. To be honest, my knees have been hurting for miles. But it’s been a general pain that creeps up after several days of heavy hiking, then recedes after a rest in town. I figured it was just the normal result of thru-hiking and nothing to worry about. It certainly wasn’t anything I couldn’t handle — or so I thought. And then we hit the White Mountains. I made it up 4,802 ft. Mt. Moosilauke without a problem. I found the ascent pretty daunting; I never dreamed I would have to climb big slabs of near-vertical rocks hand over hand for miles. But we were slackpacking, which helped, and my climbing skills have improved in the past 800 miles. The descent was something else. All I can say is thank goodness the rocks were dry! It was hard on my knees and seemed endless, but I survived — which was seriously no small feat. And we’d planned to rest the following day, so I’d be fine. Until we saw the weather report. We had one more day of sunshine before it rained. And since our next hike was a 16 mile trek from Kinsman to Franconia Notch — which entailed ascending Mt. Wolf (3,478 ft.), followed by South and North Kinsman Mountains (both over 4,000 ft.) — I did not want to attempt it when the rocks were slick. So instead of resting, we got up at 5 am and headed out. We were slackpacking again, and had twelve hours to complete the hike before our shuttle picked us up. We rested the following day. My knees felt marginally better, but my confidence was shot. So we reworked our plan for the rest of the Whites to cover fewer miles per day. We mailed home more items to reduce our weight. Then we set out the following day with our loaded packs. I made it successfully up the mountains: Little Haystack (4,800 ft), Mt. Lincoln (5,089 ft.), and Mt. Lafayette (5,263 ft.). Then we veered off the AT as planned, taking a steep downhill trail to the Greenleaf hut to spend the night. But I was in serious trouble by then. My pace was nearly a crawl. I felt like a wooden marionette, my range of motion restricted, my knees aching with every step. And I no longer felt safe. That night I wrestled with the reality that I might have to abort my hike. And when we heard the weekly weather report the following day — heavy rains, wind and hail right when we’d reach an even more treacherous part of the AT — we had a decision to make: bail now while we had a chance (and wait out the weather somewhere safe) or plod on, risking getting stranded in the storms. We decided to take a 2.9 mile path to a trailhead where we could catch a shuttle to a lodge. But the rocks were steep and wet, my progress so slow it was ridiculous. We missed the shuttle, of course. And it was clear that I couldn’t go on. I needed to see a doctor and have my knees assessed. Because the bald truth was that the trail wasn’t going to get easier. We still had the rest of the Whites to do — and the Wildcats after that. And my slowness was endangering us both. So there we were in the trailhead parking lot with no car, no ride, and no idea how to get home. But if there’s one thing I’ve learned during this journey it’s that trail magic is real. There was a park ranger in the parking lot. He’d seen the shuttle waiting further down the route. We ran over and flagged it down — and here’s where the magic kicked in. 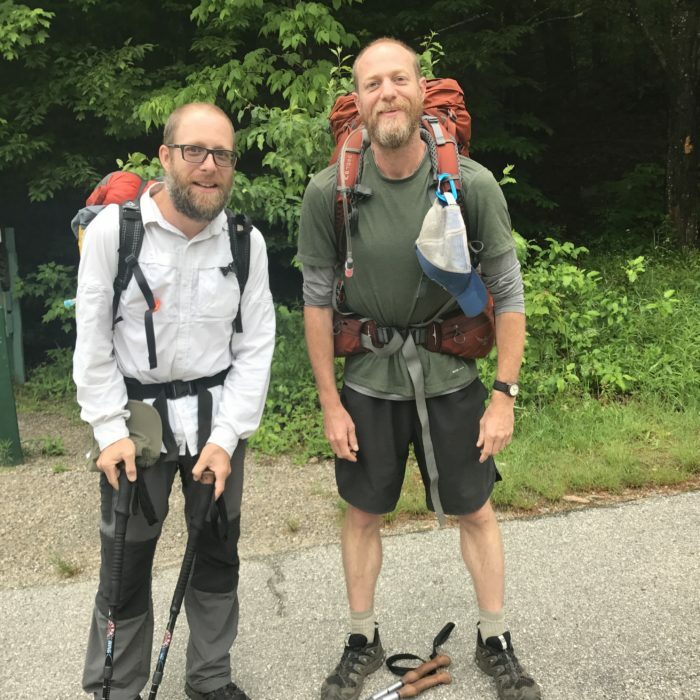 The driver was a former thru-hiker. He promised to take us someplace where we could get help, and refused to charge me for the ride. More incredibly, there was only one other passenger on the bus, a hiker from Boston who was heading home that day as soon as she got her car — and volunteered to deposit us anywhere along the way. And so she did. She dropped us off at a hotel in Concord, NH. We picked up a rental car the next day. Now we’re on our way home, waiting to see what the future holds. I hope this setback is only temporary. I hope I just need a little rest and we’ll be able to complete the trail. I’ll keep you posted. In the meantime keep your fingers crossed that our battle with the mountains isn’t over yet! Regardless of the outcome, you’re a real trooper and should be proud of what you accomplished. Gail, you’re giving me the inspiration to tackle my own hike this fall when I plod along the Galician coast for the last leg of the camino! Jayne, that’s my dream trip. I’m envious! Also, as a fellow knee afflicted individual I hope you recover quickly! Don’t let this get you down. I’ve had trouble with my knees especially on the downhill side of things when hiking out West. I can’t imagine how they would be after the distances you have clocked. Rest up, and I bet things will get better. You made the smart decision. Those mountains have been around for millions of years, they’re not going anywhere. 😉 Hike on! Thanks, Sandy. I’ve been resting for nearly a week and they still hurt, so this break might not as brief as I’d like. You are two amazing people! Hang in there! Like you said, get some rest and reassess. A great adventure you are on, but don’t let it injure you so you have trouble for the next 30 years if your life! I so admire you both! Love, love reading all your stories. Always can’t wait for the next one! Hugs! Exactly, Sherry. It isn’t worth doing irreparable harm. Still, it is frustrating to have to take a break! I had to leave the trail after 1900 miles due to stress fracture. I hope to go back in August and finish. It’s disheartening to say the least but we have to listen to our bodies and accept our limitations. You’ve done great, heal up and come back strong and you can finish. Happy trails. Thanks, Looker. That’s great that you might be able to resume your hike. I have MRIs scheduled this week and then a follow up appt on the 7th with the orthopedist. At that point I can begin to make plans, depending on the diagnosis. 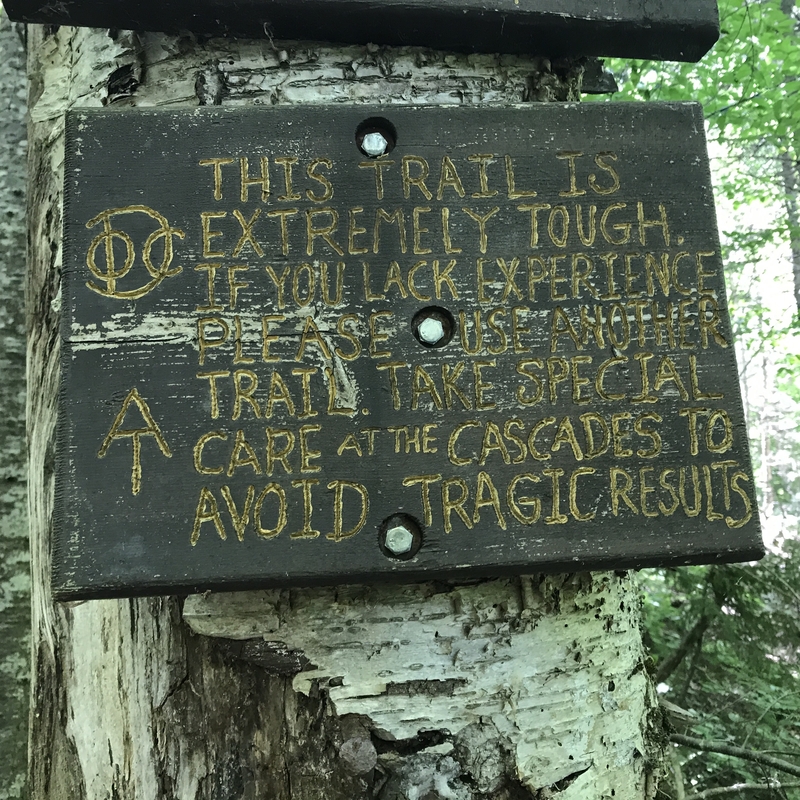 You’re right — it is very disheartening to have to get off the trail due to injuries, but there wasn’t any way I could go on. Rest assured, you’re not alone. While attempting the Prezi Trail last year, my knees stiffened after ascending Mt. Adams. Barely made it to The Perch before limping out in the morning. The Whites are tough, but so are you. You had the smarts to listen to your body when it needed to heal. Once better, listen to your heart and finish your dream. Thanks, Silver Bear. I’m sorry about your knees. It sure isn’t fun to have knee pain. I want to finish the southern part at the very least, so please keep your fingers crossed! Now you might begin to understand why a suggestion was made to hike another section of the trail in order to let the flies subsided and give yourself a chance to strengthen up for the section you are presently in (the wildcats are pretty tough). Past comments regarding your knees raised concerns the terrain in this section of the trail may get in the way of good times. 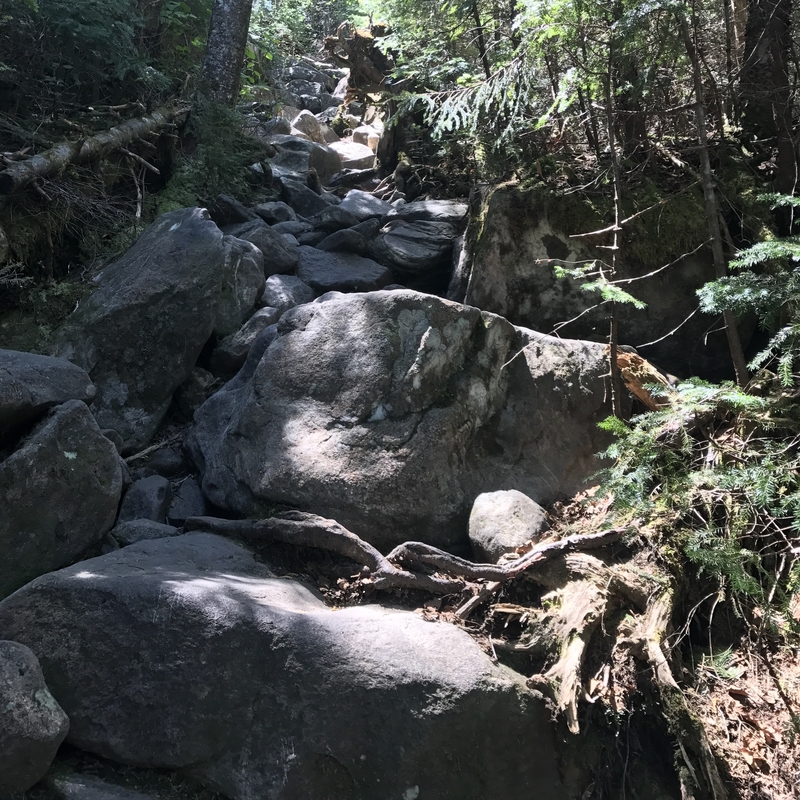 Truth be told … the most difficult section of the trail is just ahead of you… There are also many miles of easier hiking shortly after Stratton so if you can muster the strength to handle a couple of very hard weeks you will have a relatively easier time the rest of the way. There will also be slack packing opportunities around Andover. On most sections of the AT there is generally an option for smaller steps and consequently less stress on the joints. 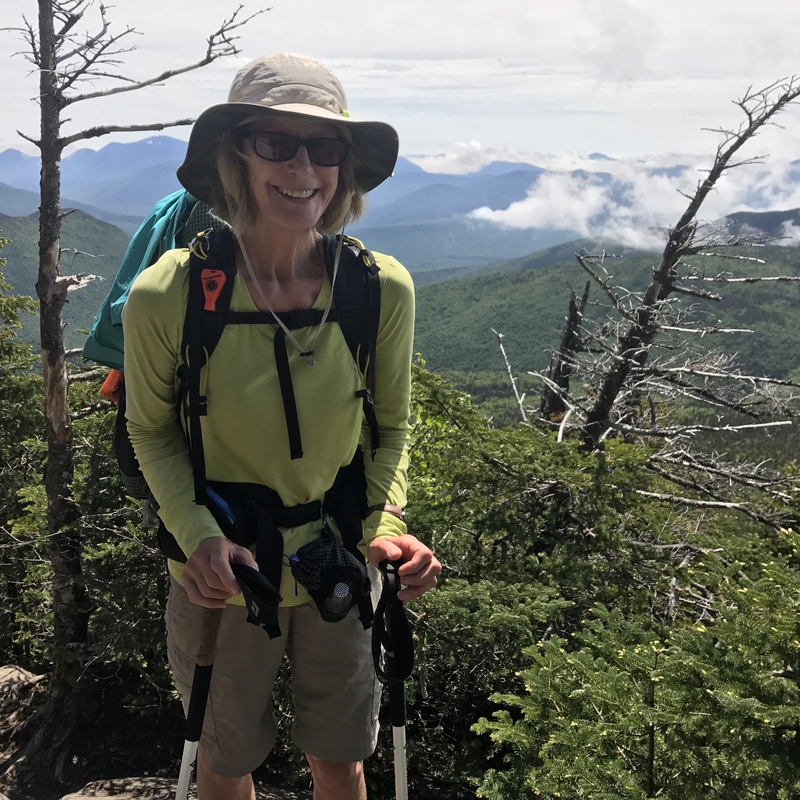 The Mountains of southern Maine are stunningly beautiful but hard to enjoy if hiking in pain. When you push on….suggest bringing an extra day or two worth of food to allow yourself a chance to slow down, if necessary, as you guys head into and out of the notch. And remember, you can pretty much camp anywhere along the way, so if necessary, pull up and take a few long rest breaks. This may mean setting up a shelter if the bugs are too bad. I am a believer in HYOH, but when people are in distress I often cannot resist an effort to lend some assistance. And yes, most lessons in life are learned the old fashion way, by the school of hard knocks. Even though the next section is strenuous, the woods are somewhat magical. Stealth blew, if I am able to resume hiking, we will do the south. I’m not sure if we will ever go back up north. I guess we’ll see, but that was more rock climbing than hiking, and not enjoyable in the least. Skipping ahead to Stratton will avoid much of the hard hiking in Maine. Yes, there are still a few mountains to climb, but there are also lovely lakes and miles of easier terrain. 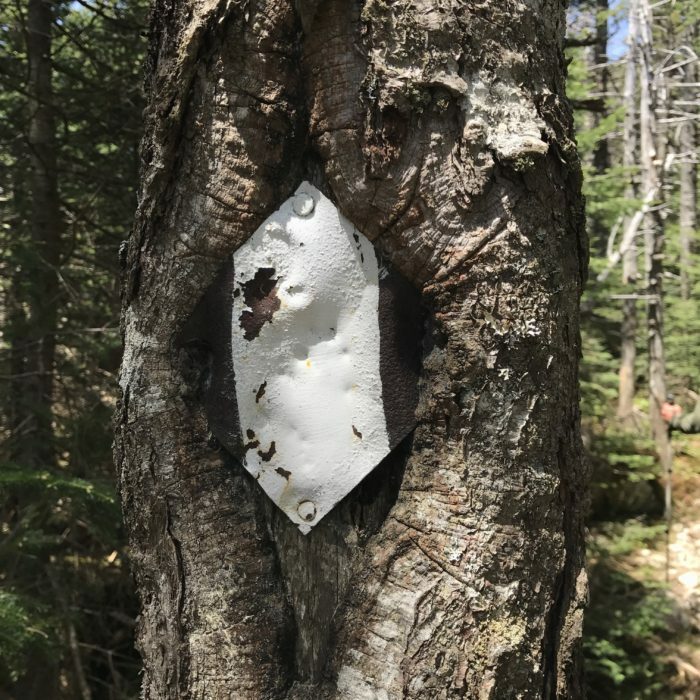 There are sections where you might hear the water rushing under the bog you are walking on, many loons to enjoy while resting in camp, a canoe to paddle (at one lake) for a water source, the largest waterfall on the trail just is past Monson and the flora at elevations is stunning. Certainly, these forests are unlike the woods from back home. Most thru hikers will have to slow down to around 12 miles / day through the Mahousics but after hitting Stratton are back up to 20 miles / day. This is a good indication of trail difficulty. Instead of skipping the whole state, please consider enjoying some of Maine wonders by skipping ahead to Stratton. Katadyn is a beast, but who knows by then you may be up to the challenge. That decision can wait for a while. I do not know how sore your knees are at the moment, but if the inflammation / soreness does not subside to very tolerable levels (without Advil®) then you may actually risk long term injury by not listening to your body. 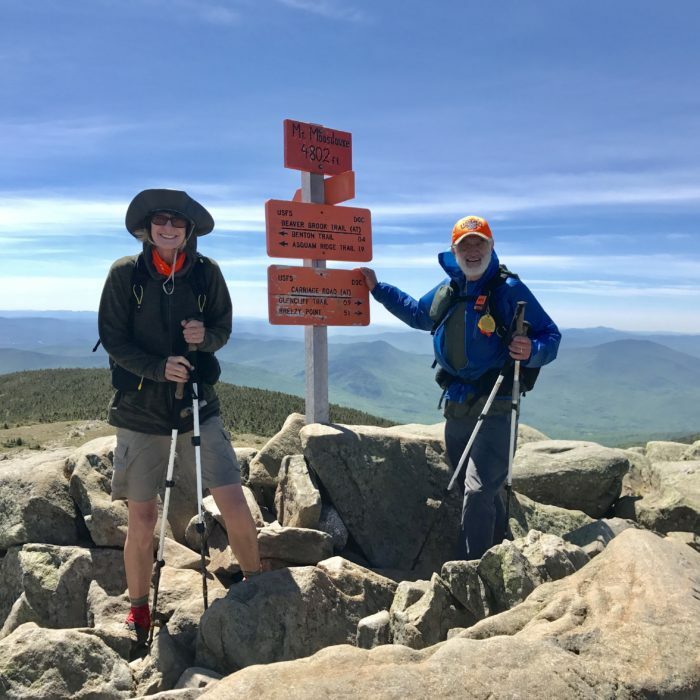 Yes, the hiking is easier ahead (some of the easiest since Massachusetts) but you should not hobble into the woods in an attempt to have a good time. Of course all this goes without saying….have your husband hike as if he were unsupported. If he carries everything a hiker would need (shelter, water filter, stove, pot, flashlight, phone, TP, ECT…) then your pack should only contain a few sundries, clothes and a sleeping bag. Switch out to a lighter pack and with any luck you will have less than 10 pounds on your back. Oh, what a difference that will make. Stealthblew, Good suggestions about the norther section. I have suggested this leap ahead to some hikers who were feeling the miles and needed something kinder on their body. You have some great insights here. I made it through my entire thru hike taking Advil for only a week or two when shin splints had me slowed up, but even then it was only at night. Cho-Pats dual arm knee braces might just do the trick. look them up on the web. Just make sure to order the dual arm model. These allow the front of the knee flexibility while placing compression on the back side. One last thing, with time your knees will get stronger. The problem at hand is they are not getting the rest they need in between workouts. Cut the pace, hike over easier terrain or shed some weight off your back. These are stratigies to cope with ailing knees until they become stronger. Unfortunately my knees will not get stronger. I’ve consulted with two doctors now, and what I have is patellofemoral compartment syndrome, which is the deterioration of the cartilage behind the kneecaps due to old age. My left knee has two fissures through to the bone, one partial one, plus general deterioration. There is no treatment or cure. So it all boils down to how much pain I can stand and whether or not I can descend safely on the rocks. I am supposed to avoid squatting, kneeling, and going downhill — which is pretty much all I did for hours each day while hiking. I haven’t given up totally, but I need to rethink my hike. I don’t want to permanently cripple myself. Don’t doubt yourself or your body when things are at their worst. That’s a decision to be made when you are warm, cozy, and full without knee pain. A decision made any other time than that, is one made under duress. Have faith in the process, and know that you have an entire hiker community behind you. If it takes you 3 days to cover 10 miles then it takes you 3 days to cover 10 miles. If you give yourself adequate time to rest, and make the decision not to quit then everything else becomes easy. It doesn’t matter how hard it gets. You made the decision. You can do it. Sometimes you might get 10 minutes of sun during 2 solid weeks of rain, but the truth is that with the right perspective, and the right support network, that’s all you need. Have faith. Stay motivated. Foster a healthy mental environment that is conducive to your success. Happy trails. Thanks, Zach. It is disappointing that I won’t be able to finish the entire trail this season, but I’m still hoping I can do the bulk of the south. Im going to do some test day hikes here in MD this week and see how much my knees ache. I wish this were a temporary condition but it appears it’s a permanent problem with my knees with no cure, so I need to rethink my strategy. Gail, you made the right choice. Bravo for listening to your gut. Hiking can make you feel like a superhero. It can also humble you. I’ve felt both exhalted and defeated during my time in the woods. Be proud of what you’ve accomplished so far, and keep looking ahead to the future. Thanks, Jen. I have a very hard time giving up once I’ve set a goal, so leaving the trail wasn’t easy. Now I just need to figure out if I can get back on. It was such a treat to have you at The Notch. I am wishing you the best as you make plans and figure out where you go next. Smitty and Skyman are two incredible individuals and I’m so glad they were there to support you. There is some amazing support out here in the hiker community, reach out to it! Bookie, it was great to meet you, too! And yes, Skyman and Smitty are amazing. I was lucky to cross their path. In fact, that’s one reason I’m anxious to resume my hike. The hiking community is phenomenal.